Sylvanus Smith, once described in a city directory as a “hog driver,” was a free black Brooklynite who promoted and protected racial equality, business ownership, and property development in the community of Weeksville, New York. Smith was one of the original landowners of Weeksville. In order to attain the right to vote, which was denied to most African Americans in New York and across the nation at that time, Smith led a group of free blacks in purchasing land in a then rural area of King’s County, New York. In 1838 eleven years after New York finally abolished slavery, Smith and other African Americans, including Peter and Benjamin Croger, William Wilson, James Pennington, James and Elizabeth Gloucester, and William and Willis Hodges, lived in the communities of Williamsburg, Fort Greene, and Cobble Hill. They gave up their urban existence to create a small middle-class farming community which they called Weeksville after James Weeks, an African American settler from Virginia who was the earliest landowning resident in the area. Farming was only part of the motivation for the Weeksville settlement. By purchasing land, the families ensured that they met the $250 property requirement for voting established by the 1821 New York State Legislature solely for black males in the state. Weeksville is now part of Bedford-Stuyvesant, and the Weeksville farm of Sylvanus and Ann Springstead Smith was at the corner of what is now Fulton Street and Buffalo Avenue. Smith was also committed to African American educational achievement as a means to improve the community’s social status. He sat on the board of trustees for the African American Free School of Brooklyn, also known as Colored School No. 1. The school was founded on November 2, 1787, and subsequently opened in 1795. Its mission was to provide education to children of slaves and free people of color. Its leaders also advocated the full abolition of African slavery. 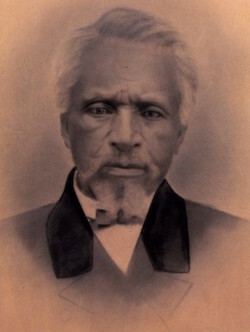 Sylvanus Smith and his wife Ann Springstead Smith had seven children. Two of their daughters, Susan Smith McKinney-Steward and Sarah Smith Thompkins Garnet, later became prominent citizens in their own right. The Smiths instilled the value of education and social activism in both their daughters. Smith’s social status allowed his children access to a quality education. Susan and Sarah were both educated in the classics and music. Susan Smith entered the New York Medical College for Women in 1867 and earned her M.D. in 1870, graduating as valedictorian. As such, she joined a handful of black women physicians who emerged in the Reconstruction period. Sarah was educator and suffragist in New York City. She was a promoter of educational opportunity and equality and in 1863 became the first African American female school principal in the New York City public school system. Sylvanus Smith died on September 17, 1911, in Brooklyn, New York, at the age of eighty. http://pursuitoffreedom.org/abolitionist-brooklyn/; John L. Rury, “The New York African Free School, 1827-1836: Community Conflict over Community Control of Black Education,” Phylon, 44: 3 (1983); Ellen M. Snyder-Grenier, Brooklyn: An Illustrated History (Philadelphia: Temple University Press, 1996).